Remove the cluster lid C screws (A). 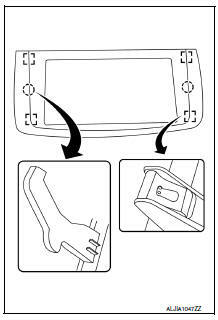 Disconnect the harness connector from cluster lid C.
Remove the center ventilator grilles assembly and hazard switch from the cluster lid C (if necessary). 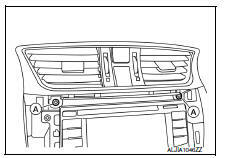 Refer to VTL-9, "CENTER VENTILATOR GRILLE : Removal and Installation" (Center Ventilator Grilles) and EXL-129, "Removal and Installation" (Hazard Switch). Release cluster lid C lower clips and pawls using a suitable tool. Remove cluster lid C lower.